Employment on Fetlar - as with on many small islands - often consists of people having several part-time jobs to make up their income. As the population grows the number and variety of jobs will also grow as local provision is put in place to meet demand. In summer there are a number of seasonal jobs available in the tourism and hospitality sectors. Visit the Shetland Island Council jobs page for a list of current vacancies. 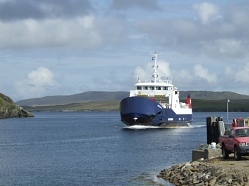 Zoom imageFerry from Yell to Fetlar The new pier and breakwater for the island ws officially opened in December 2012. This new development will offer some significant possibilities in marine-related sectors.The Fetlar based ferry can now safely be moored here year round, securing the jobs of the locally based crew and offering new opportunities for relief crew. The new berthing face is approx 40m long with boarding steps and heavy duty fendering. It is suitable not only for Fishing and Aquaculture vessels but also so for small pleasure boats and visiting Yachts. A large area suitable for development has been created where the stone was extracted for the breakwater. The one item still required to allow this facility to achieve its full potential is a mains freash water supply. This is currently being investigated. Zoom imageBuilding and construction opportunities There are further employment and entrepreneurial opportunities in the construction industry. 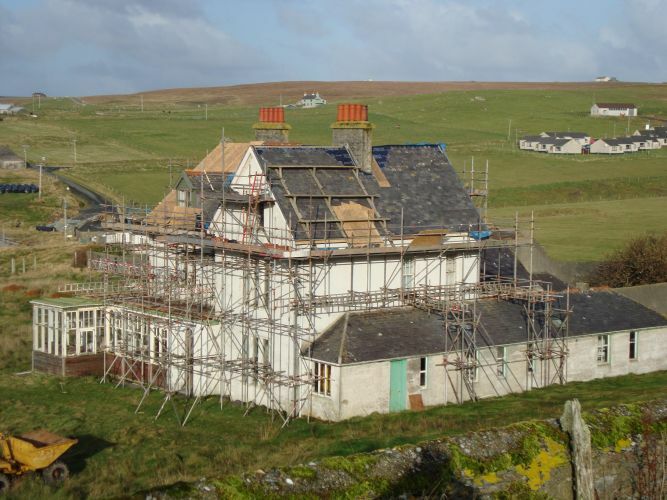 A number of building and restoration projects are underway or planned for Fetlar, and there are possibilities for a number of new-build houses. A locally-based company would be well placed to take advantage of any work coming up, as at present all contractors have to travel into the island. For those with wider ambition there are always significant opportunities arising on the neighbouring islands which could prove a natural area of expansion. Fetlar was part of a broadband pilot project run by Shetland Islands Council to provide an island-wide wireless broadband network. The system ran reliably for 3 years and has now been upgraded. There is now a backhaul link of 20-25Mb, which now generaly allows speeds of up to 10Mbps down and around 3mbps upload. Although due to contention among a relatively small number of users, actual speeds can vary significantly depending on use. BT has also upgraded their broadband provision to provide an up to 8mb service. However due to the position of the exchange which is quite distant from most of the population, most residents will see much lower headline speeds. These new services mean that people can now work remotely, or run a business remotely, from Fetlar. There are occasionally some part-time and relief posts available in social care. There are also sometimes full and part time opportunities based aroiund the Yell or Unst Care centres for qualified care staff. 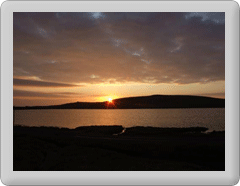 Fetlar is a haven for visitors who come to the island for its marvellous wildlife and scenery. There are certainly opportunities for entrepreneurs to develop a variety tourism-related businesses on the island, to complement and extend existing provision. Occasionally crofts do become available and Fetlar is one of the most fertile places in Shetland. However many parts of the island are covered by management agreements which restrict traditional crofting activities. There are other options as diversification away from the traditional ideas of crofting is supported by the Crofters Commission. Diversification could be a way of making at least part of your income from crofting. If you are looking to start or develop your business in Fetlar there is a significant amount of support available. A good starting point for further information is http://www.shetland.org/discover/live-here/do-business. On-island support is also available from the local Fetlar Development worker. If you are looking for employment rather than to start your own business then we aim to provide details of employment opportunities as the become available on this website. The local development worker may be aware of any jobs which may be becoming available so please feel free to contact him.